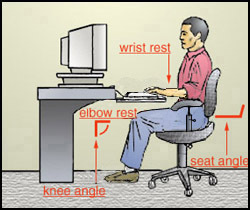 The proper adjustment of the chair is related to the proper placement of the monitor, keyboard, mouse, and work surface. Improper size, shape, or choice of materials for the seatpan and backrest may result in uneven weight distribution, contact stress, decreased circulation to the extremities, and awkward posture. The seat and backrest of the chair should support a comfortable posture that allows frequent changing of the seating position (Fig. 1). The seatpan should accommodate the specific employee (not too big/small). It should be padded and have a rounded, "waterfall" edge (Fig. 1). This will reduce contact stress to the back of the legs. The angle of the seatpan is also important. A seatpan with an adjustable tilt ensures the worker is able to maintain proper support in different positions. Chairs should be height adjustable, especially in work areas where they are shared by a number of employees. 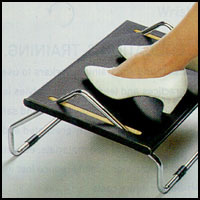 The chair height is correct when the entire sole of the foot can rest on the floor or a footrest (Fig. 2), and the back of the knee is slightly higher than the seat of the chair (Fig. 3). This position allows blood to circulate freely in the legs and feet. Knee slightly higher than the seat of the chair. Armrests that are too high or too low can produce awkward postures, create contact stress to the elbow, provide inadequate support, and may prevent the operator from moving close enough to the work-station. Adjustable armrests (Fig. 4) can be lowered to fit under work surfaces. This allows the user to work from a comfortable distance. 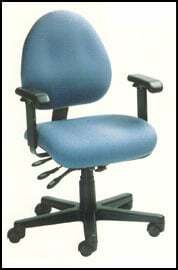 The armrests should support both forearms while the employee performs tasks and should not interfere with movement. Test Your Ergonomic Savvy...How Safe Is Your Work-Station?